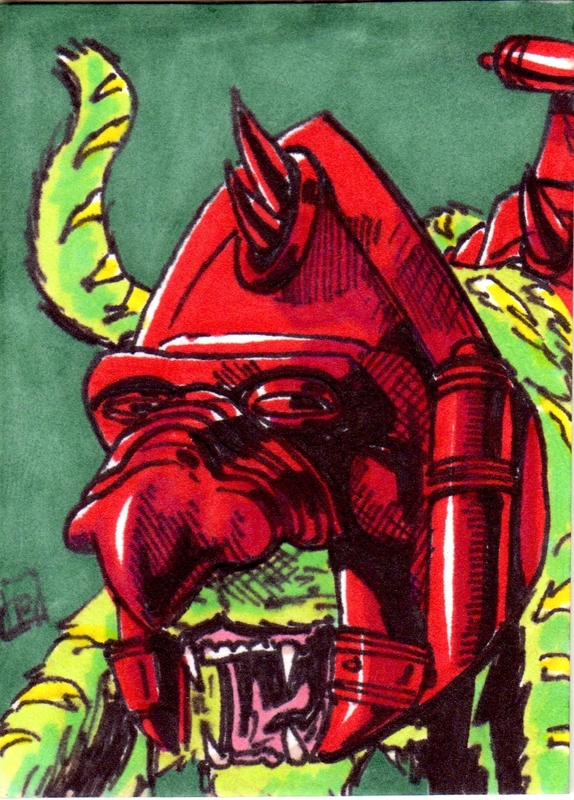 Taylor's Sweet Little Art and Nerd Site: Sketch card of the Day- Battle Cat! Today's deviation is Battle Cat! When I was a kid, my family had two cats. Their names were Shasha and Rusty. Shasha barely let me touch her so she was more or less safe from the craziness of a child. Rusty, on the other hand, was not. With that being said, Rusty was hence MY CAT and my play buddy and thing. I viewed Rusty as my Cringer, my Battle Cat. I'm actually surprised he made it to the age of 18 in human years after a couple of roping incidents (one almost killed him) and dress up (where I actually tried to tape my small Battle Cat saddle onto him). Needless to say, Battle cat has always struck an awesome family pet loving cord in my heart cause I thought of Rusty as Battle Cat! The vintage version of Battle Cat was purchased for me from a second hand shop when I was a kid-o. I remember being sooo excited that I had found one that had both saddle and helm. It was a very exciting day! When I finally got Mattel's Masters of the Universe Classics version of Battle Cat, I was washed with so many memories of nostalgia. One from being in the Goodwill store with my bounty of He-Man items including Battle Cat, two playing with my good friend, Rusty the cat, that I loved so very much and the rest being all of the many wonderful days of playing with He-Man with his best friend, Battle Cat. Oh, if you are a filmation He-Man and the Masters of the Universe fan, don't be offended by what I am about to say: I never had my Battle Cat talk. He just roared a lot and chewed on Clawful and Merman. 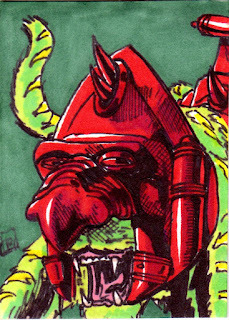 You can also see this sketch card here. Now, I'm opening commissions. If you are interested go to the commissions tab!